The NRA Basic Personal Protection In The Home Course teaches the basic knowledge, skills, and attitude essential to the safe and efficient use of a handgun for protection of self and family, and to provide information on the law-abiding individual’s right to self-defense. This is an eight-hour course. Students should expect to shoot approximately 100 rounds of ammunition. Students will learn basic defensive shooting skills, strategies for home safety and responding to a violent confrontation, firearms and the law, how to choose a handgun for self-defense, and continued opportunities for skill development. Students will receive the NRA Guide to the Basics of Personal Protection In The Home handbook, NRA Gun Safety Rules brochure, the Winchester/NRA Marksmanship Qualification booklet, and course completion certificate. 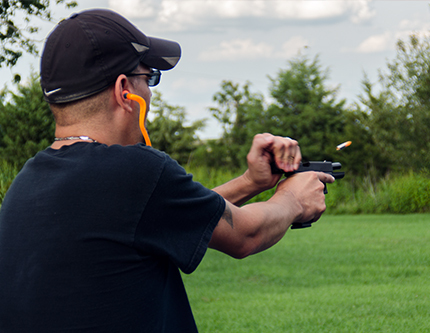 Prospective participants must show proof of shooting experience with one of the following: NRA Basic Pistol Course Certificate, NRA FIRST Steps Course Certificate, NRA pistol competitive shooting qualification card, military DD 214 with pistol qualification, or an Illinois CCW Permit.